Hi all. I thought I would introduce you to a work in progress. This is a lesson how "That seems a simple idea" turns into "How many of those things have I trashed now"
I will in the future do a more detailed description of the process, with some shots of the trickier bits of the mod. First of all lets start with a simple idea. For my living room I wished a silent HTPC. It had to be silent as I intended it to run 24/7 and I like my piece and quiet. I also play some gentle jazz from time to time and the whine of a fan ruins the effect. So a plan was born. 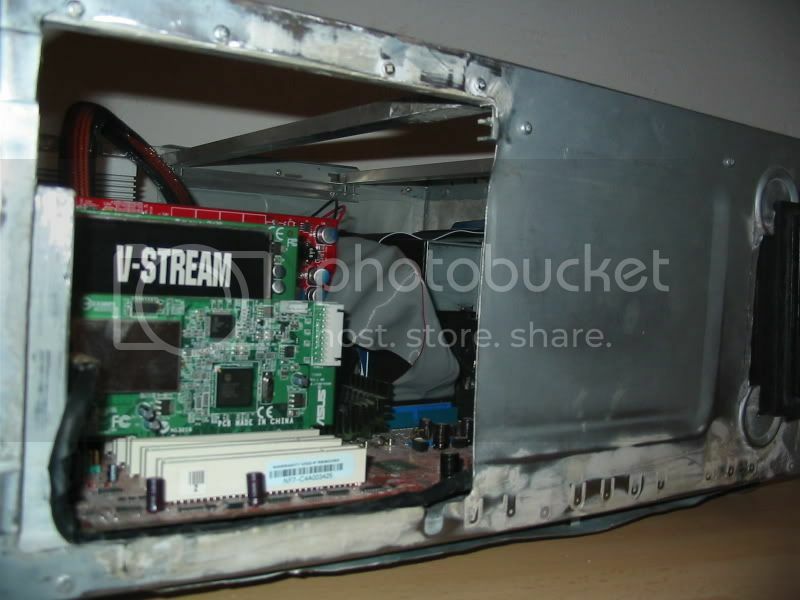 Make a 100% passive HTPC. On reflection this turned out to be the easier aspect of this machine. 2x512mb DDR 400 ram heatsinked with nexus memory sinks. Running in dual channel mode. 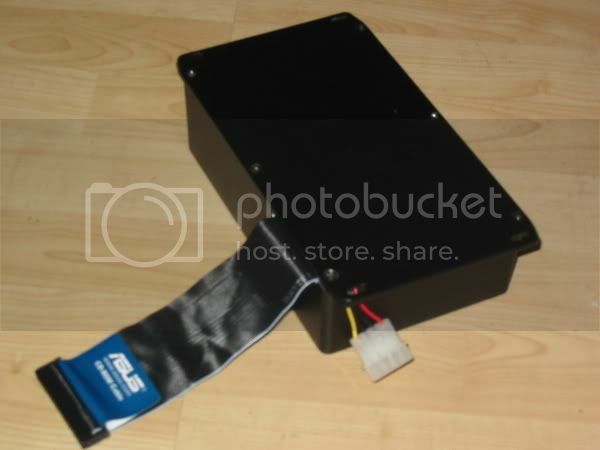 Silverstone 30NF 300w power supply. 100% passive piece of alu gorgeousness! I then thought (and this is where I have to say a leson could be learned about how dangerous thoughts are!) There is space in their for other stuff, what else could I fit in there. The answer was staring me in the face. My playstation 2. 1. Extend the controllers and Mem cards to the side of the new case. 2. 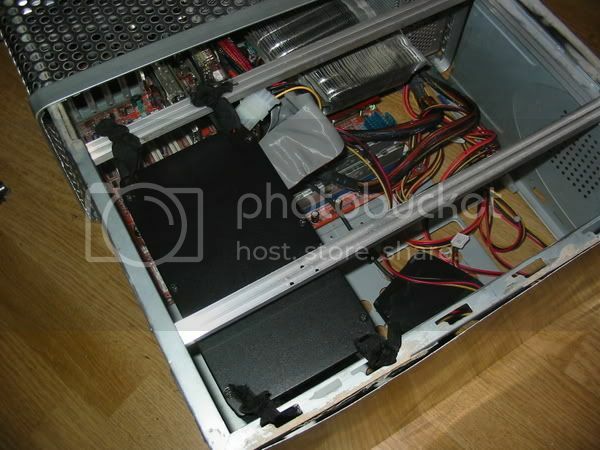 Extend the graphics output to the back of the new case. 3. Work out how to get the power and eject buttons to the front of the case. I searched the web, but noone seemed to have done this mod before. This is an untidy first draft at the front facia. 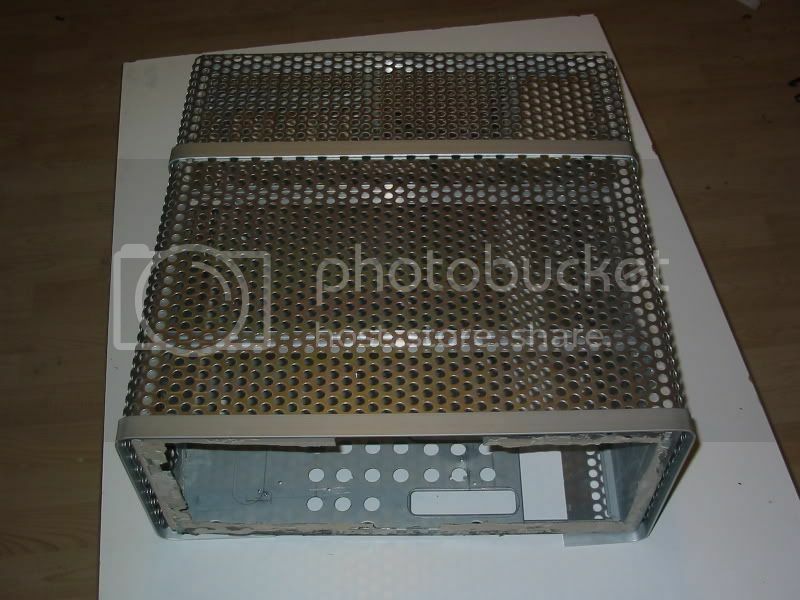 I used 2 lian li optical drive bay plates. The power buttons are funky stainless steel flush fit vandal resistant door entry push to make switches. 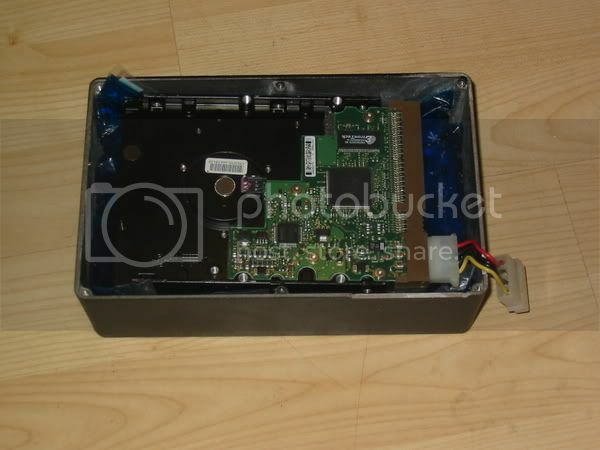 The one to the imediate left of the drives is attached to hte PS2. The Eject button on the lower drive bay opens the PS2 The top is the DVD drive for the HTPC. This is a top shot where you can see the PS2 in position. 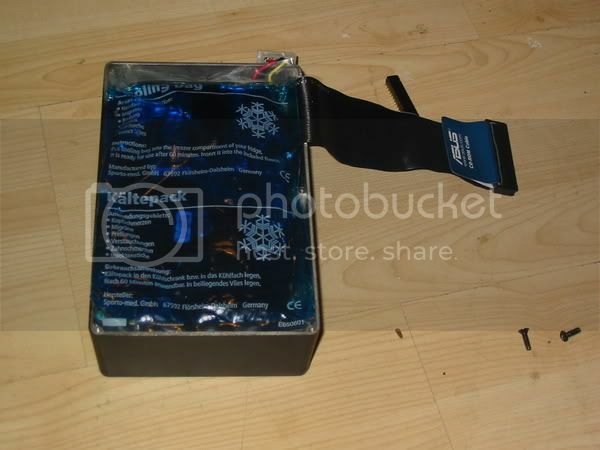 For the moment the PS2 is being cooled by its fan the V10 fan is exeptionally quiet once you take it out of its case.. This is the third PS2 that I have used. No 1. Died in an unfortunate soldering accident when I tried to wire the power switch directly to the mobo. No 3. You can see in position. I bought the two replacements as faulty on E-Bay This is a good way of getting hold of replacements. I used parts from the first to repair them. You can see in this photo how I extended the game ports to the side of the case. I cut out a section from the first PS2 case which pokes through. I then seperated the control board from the controller chassis and soldered about 30 odd wires to allow it to be placed. 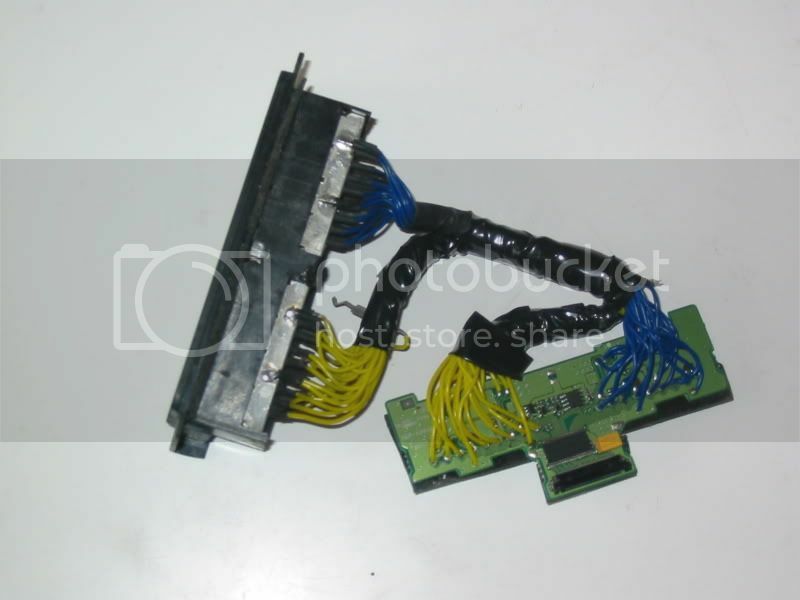 The controller board is attached to the PS2 with its origional FIC cable. You can see also how I stacked the drives. 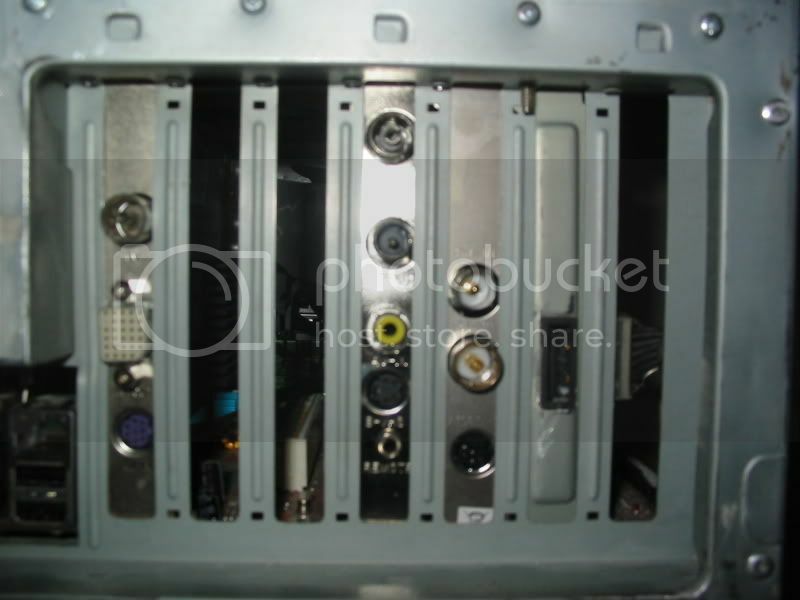 The old 5' drive bar was cut up and bonded to the top of the PS2 DVD drive. Note also to the right of the fan. This is the graphics output of the PS2. I soldered about 12 wired to the solder points on the PS2 board. I left the origional output in place as I had a spare. This made testing my extended port easier. This side view gives a good idea on the case construction. You can see the alu bars that I bonded in to strengthen the case. I also had to move the PSU mounts a couple of CM to take into account the Typhoons position so close to the edge of the mobo. 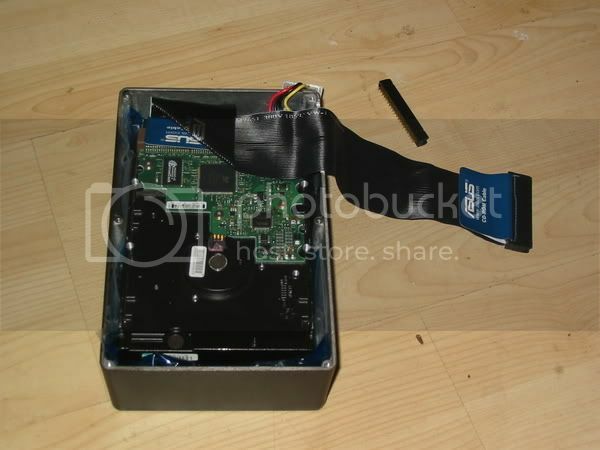 This photo demonstrates how I extended the graphics output of the PS2 to the back of the new case. I desoldered the output from the origional (V7) playstation. 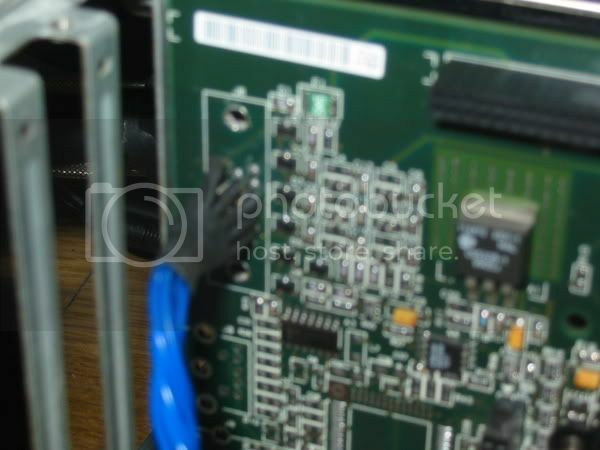 It is mounted onto a PCI Blank. And you can see where it pops out the back. Still got a little tidying to this. One more into the side of the machine... In the far right you can see the playstation controller port. It is still to be bonded in. Going to paint the case first . So there it is so far. Still got a few bits and pieces to do. 1. Finish off the case with body filler and paint it black. 3. Make a new unblemished front facia. Same again. 4. Mod my mce remote to an internal header, solder the LCD directly to the parallel port. But that sounds all too easy.... Got to throw something else into te mix. a) Possible usb mouse scroll wheel to volume/controll knob on the left of the facia. Big round alu or steel dial? b) Possible port for my Razr phone on the relatively unscathed right hand side of the case? c) Possible/almost definate heatsink mod to the undersides of the mobo to improve cooling further? 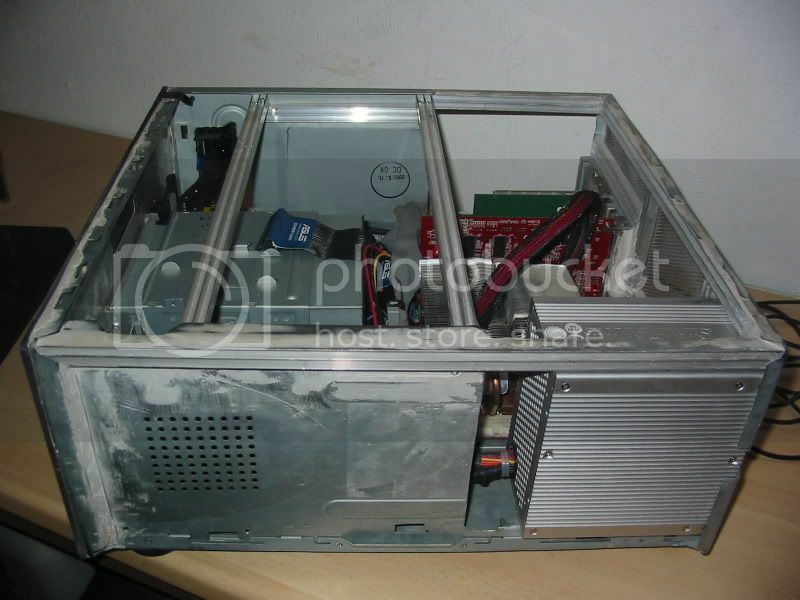 d) Ext cooling/HD suspension for the HD currently encased in a Silentdrive enclosure? I'm open to other suggestions? Last edited by justblair on Tue Oct 17, 2006 8:02 am, edited 4 times in total. a phone port would be a neat idea. i've been thinking of making docking stations for my phone and pda and ipod; the manufacturer-made ones are just way too expensive. i think given your razr's usb cable you should be able to fabricate something reasonably useful! heatsinks on the underside of the mobo sounds like overkill, it'd probably just be better to use a 5v fan to keep the air moving and i'd assume that'd be enough. your c) and d) options seem like overkill to me... i'd just leave those options alone and only tend to them if necessary. a) and b) though might be worth investigating. looking forward to the whole thing coming together! Yep. It would have been a lot less effort. I'm not even sure that I saved any money making it myself (I lost count some time ago). 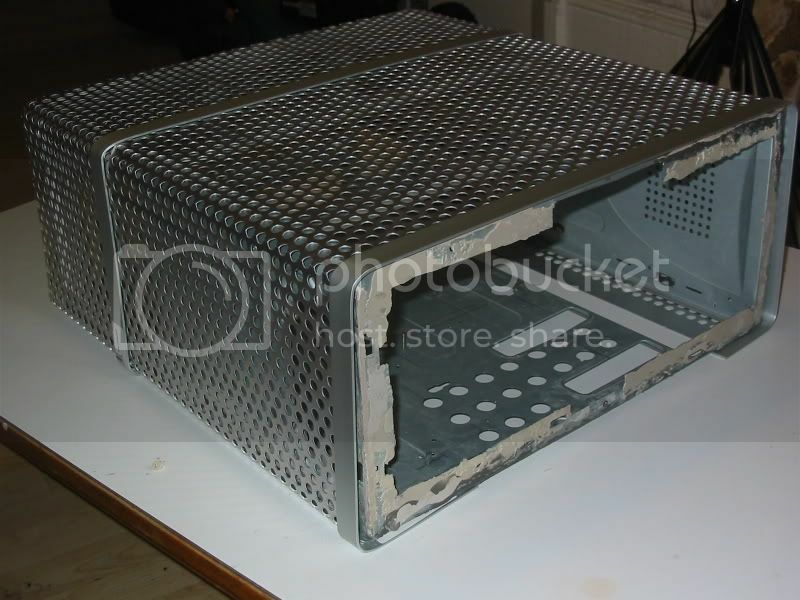 But I wanted to go passive on the pc side, and the thought of hacking up a brand new and expensive case just gave me the shudders. 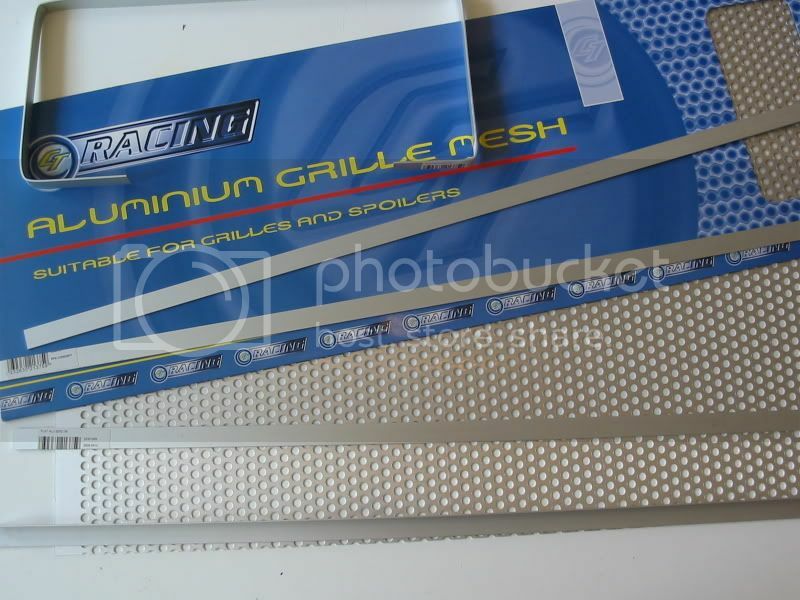 The big mesh vents are the only thing really that can be done for passive. However, I think that when I get the case tidied up, I will have something unique and very much to my own tastes. Ye I'm liking that idea as well. I'm not sure that there is a real need for it though. Thats not a good enough reason not to do it though! As much sense as a fan would make, 100% passive was the goal I set myself. It may not make much sense, but I guess you have to set yourself the challenge and stick to it. C and D are most definately overkill. However someone else here just got a 5c drop on a passive processor using method C. I'm not even sure wether he meant passive in the same way I do. I'm so tempted to try it, even just for the discovery side of things. D I could probably get away without doing. 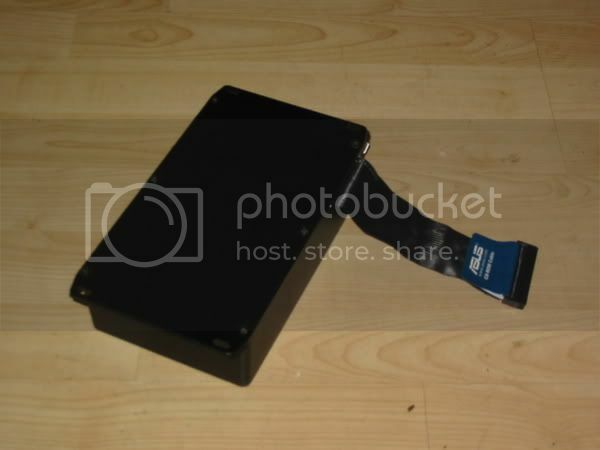 The silentdrive does a good job of silencing the drive. Even very late at night I have to get close to hear it working. Just cant stop playing with things. I'm also eyeing up playstation 5'LCD screens on flea Bay at the moment. I'm gaining some understanding of how teenage kids end up with a score of UV lamps, screaming fans and windows on their pc's. Once you start the modding process, ideas just keep cropping up. Colour wise, I'm thinking black for the bit you can see, its cover either gloss black (To match my amp which sits below it) or silver to match the tv. The front facia will be painted black behind the perspex. 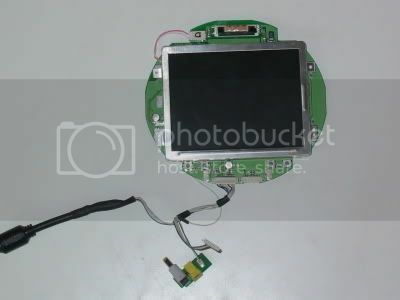 I've tried this already, it makes the IR port and LCD disapear and simplifies the look of the front. hehe yeah it's very easy to lose count of the $$$ when doing projects like these - my projector project blew out to 4 digits, but then again that was half-expected. and the uniqueness is obviously something you can't buy, as well as the pride and joy that come along with it! riteo... i must have misread your first post, i remember reading "100% passive" as well as "ps2 fan" and the 2nd must have overruled the 1st if you are still using the ps2 fan though, perhaps there's a way to duct the area behind the motherboard to the ps2 fan so you get at least a little bit of movement? However someone else here just got a 5c drop on a passive processor using method C.
The front facia will be painted black behind the perspex. I've tried this already, it makes the IR port and LCD disapear and simplifies the look of the front. Yep. I have to take that one on the chin. I'm thinking about going passive on the playstation as well. Trouble is monitoring the temps on it could be an issue. When its in standby though the fan doesn't spin. So I'm thinking that I may just live with this. The DVD drive on it is way noisier than the fan. So when your playing it it the fan really isn't the issue. That is something that didn't click with me when I read the post (here in the last few days). It makes a lot of sense. This should make me less interested in this mod, but you know it actually makes me want to do it more... Just to find out. I am twisted. 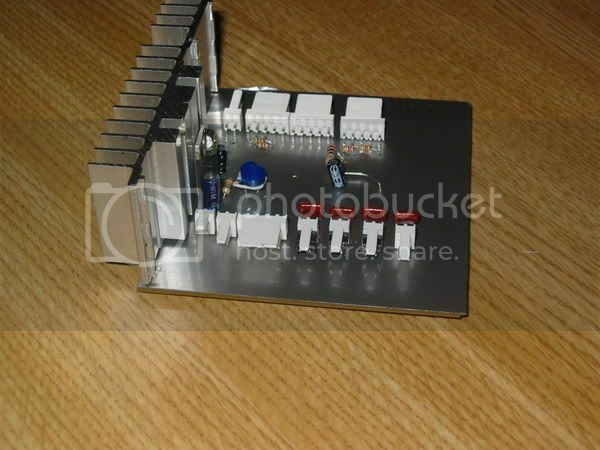 It would make more sense with the power regulators, NB and SB's which sit flush to the board. I have to say that this has been an engrossing project. From design to implementation. The finishing is actually the bit I am putting off. partly because I just hate sandpaper and paint, partly because I have enjoyed the technical challenges. I keep adding stuff into the mix I think just to prolongue the pleasure. Time for an update, got some new batteriesfor the camera! As you can see I took it apart. Wired it up to a vga cable and got rid of most (will trim further before fitting) of the cabling/speakers etc that I didn't need. The other loose cables I couldn't identify so left on. Now I know I dont need them I will snip them. 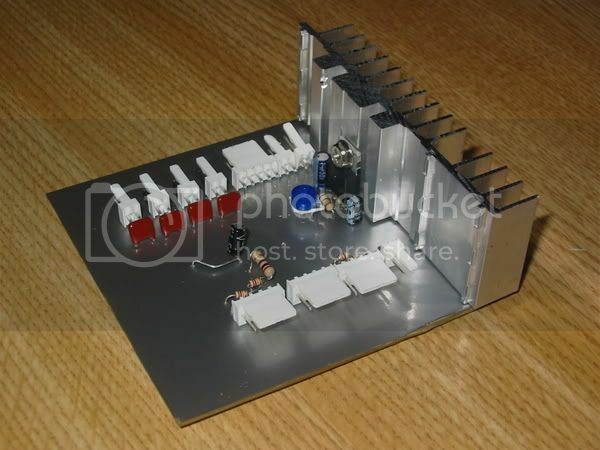 I also intend building a power regulator to run the screen off of the silverstone PSU. Doing the circuit building last on this project so that I can make one bulk order for chips, resistors, leds caps, mosfets ect. 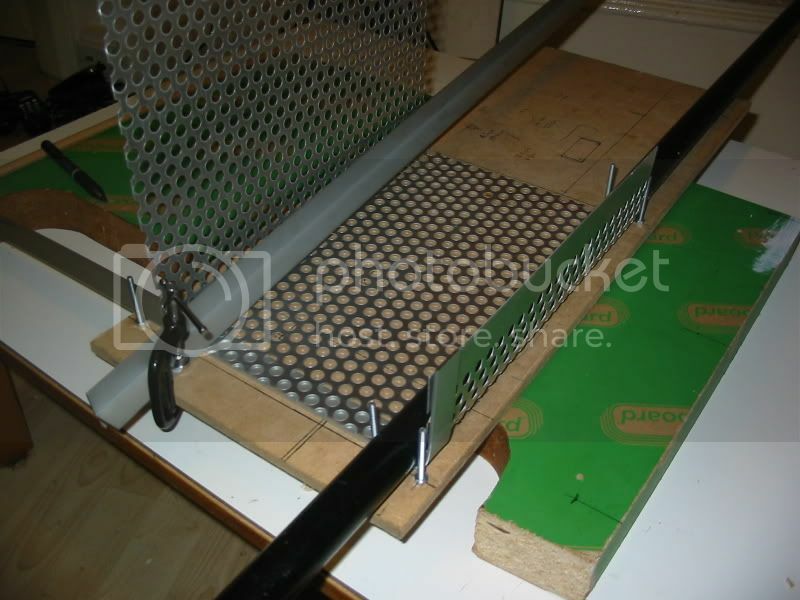 In the top right corner you can see my first experiment with the anodised strip. I formed it into a band which will wrap around the case. There will be 3 of these bands. 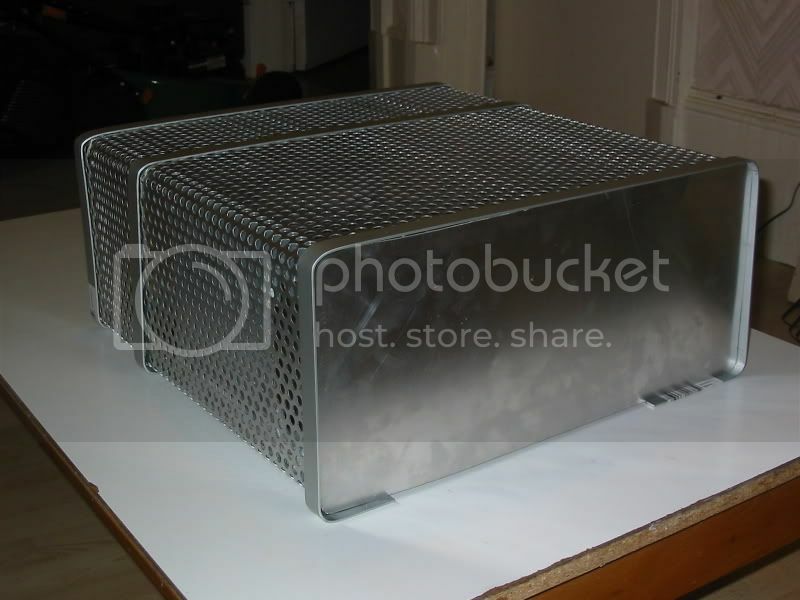 One at the front, which will also frame the pespex facia, one in the middle to join two sheets of mesh and the L channel at the back to finish the rear of the lid. I have some 3mm by 12mm zinc plated countersunk screws that will fix the bands to the mesh/case. I intend doing these in double rows around the bands. This gives me a chance to try out my drill press! This is kinda hard to explain, perhaps when you see the lid it will become clear. 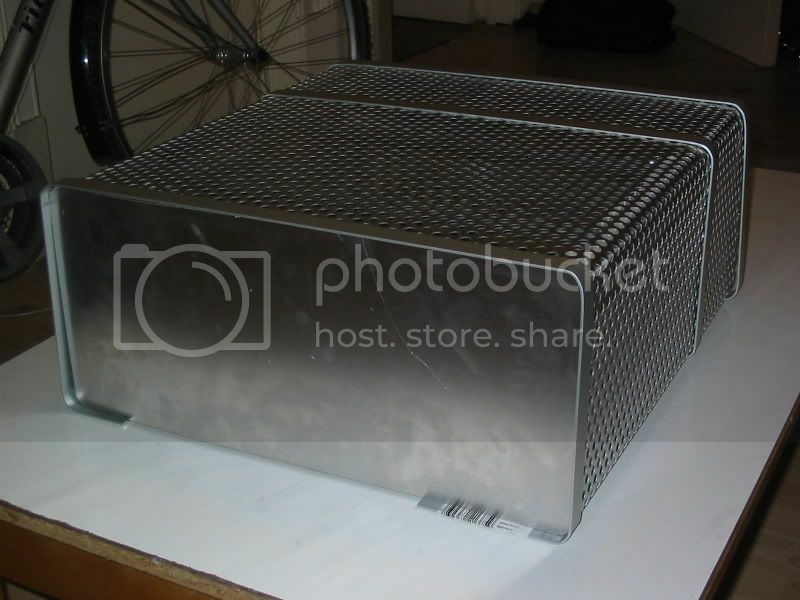 Here you can see the modders mesh being formed into a lid. Did this with two sheets, one cut down to fit... The end result i am pleased with! I think that once the chasis is plainted black, with a few more panels cut out for ventilation this is going to look pretty good. When I held one of the anodised strips in place, the contrast was subtle but distinctive. 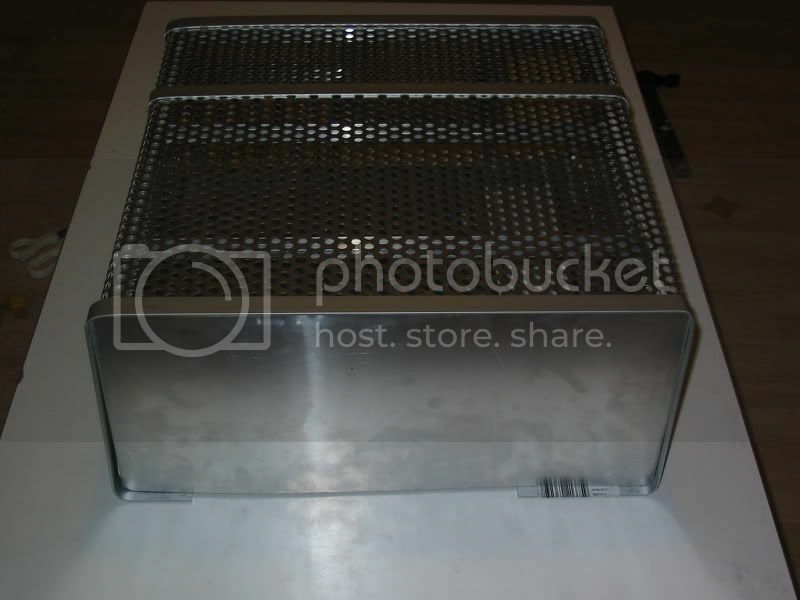 It should also provide excellent ventilation for the system. I will probably start afresh with this one. I have a couple of spare ports from the playstations I killed. I am now considering adding a few leds to the case interiour. Just for laughs really, they will be switched as practically speaking I wont want that distraction while watching TV. I think though a blue glow through the mesh will look good. Happy to hear your thoughts? Trouble is monitoring the temps on it could be an issue. Do you really need to? The chips are quite cool, i think any small P-III heatsink would be more than enough. Just replace that awful 3mm thick thermal pads with Arctic Silver. 2. 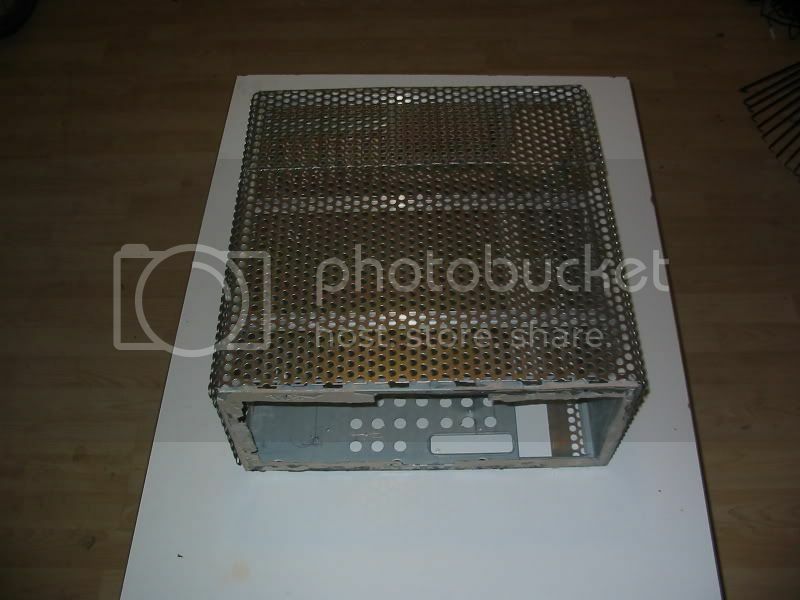 My origional design had sheet steel above that section of the case... Clearly that design has evolved, co that perhaps opens the arguement again. 3. The temp thing is just an unknown quantity for me. 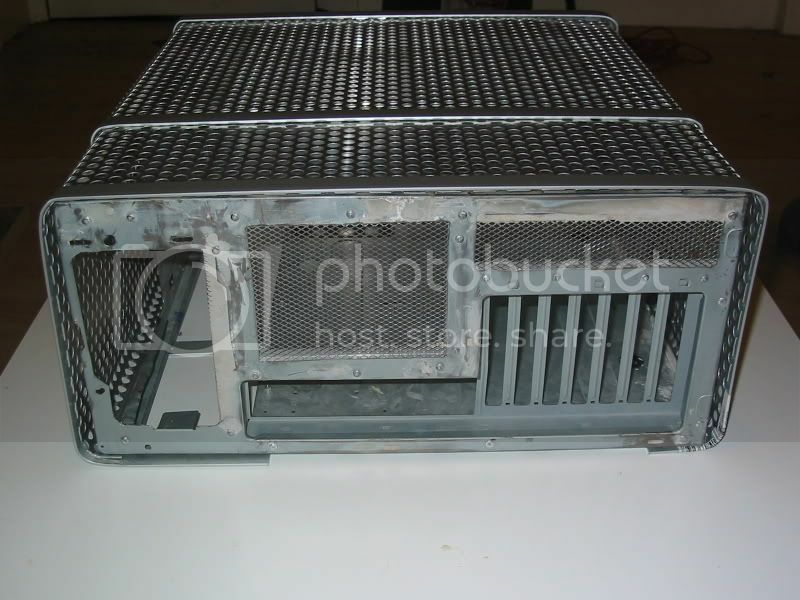 Sony certainly designed the playstation to have some active cooling. However in the Sony case a good amount of that cooling was for the power supply (now sitting in my parts bin) I just dont know what sort of heat these chips collectively produce. I saw a post here recently about making a temperature monitor that can be read through the IC3 bus. The circuit itself is simple enough for even me to tackle, but the chip it uses is designed for surface mount. Thats taking my soldering skills to a new level. As well as really needing me to venture into pcb manufacturing to get a neat job. If I can measure the temps, I can run the PS2 passive. Speedfan could control an emergency fan to save me burning the thing up. 60c would be a conservative estimate for the chips heat surviving properties, I would use that as a cutoff point. Not sure if my skills are there yet to make this circuit, but I have no fear of developing them! Was going to finish the case before I added these images, but I got a bit over excited and started the update. I just completed 2 of 3 of the anodised "bands" that finish the case lid. The result is exacly what I hoped for! First how I made them... I used the same bending rig as before, this time though I put the origional mesh in as well as the strap. 2 benefits to this..
1. Gives me a very accurate fit, mm perfect in fact with little effort. Pretty easy this time, in fact a 20 minute job at most. The level of precision required scared me off starting this job for a few days. Turned out a lot easier than I thought. Any small gaps you spot here will disapear when its screwed together. Nothings fixed yet. I'm getting excited. Going to try and not get too drunk tonight (My mates away to Australia to live, tonights his leaving do). If I dont have the shakes too bad tomorrow, I might get the majority of the exteriour done! I have seen you have found the beauty of aluminum! Waiting eagerly for the update! I did get too drunk... waay to drunk! Going to use strip instead, then tidy the gaps some other way. ps... Let this be a lesson to you kids out there... Dont Drink and Mod!! Here are the last few shots of the project as it stands at the end of the weekend. I'm a bit disapointed with my progress, But I had to take frequent naps today. In my defense I am stuggling with the cold, though the drink did have a devastating effect on my effectiveness today. 1. Got another alu strip from the hardware store. 2. Made the third band for the case top. 3. Cut and shaped a thin alu sheet for the front facia. I have not though cut the relevant holes for drives, screen and switches yet. I wanted to wait till my head was a bit clearer before doing this design orientated stuff. You can see in the last shot the rear of the machine. There are two 1.3 cm gaps at the sides. I had intended using the L angled alu to fill this and make up the last band... That was the cutting and shaping I could not get right this morning. Instead I will fill this gap another way. Probably going to use perspex dyed black for this. It should finish off the rear of the case nicely. Well this weekend I did not have much time to get much works done, been out protesting... Next weekend is looking pretty limited for time as well. By the time I got back I was pretty knackered... lots of time on my feet. I did put in a few hours on the software side, and I got good news and bad news. Good news was that using Samurize I managed to put together a pretty decent looking status screen for the psone screen. It will no doubt evolve in time, but for a first attempt I am pleased. 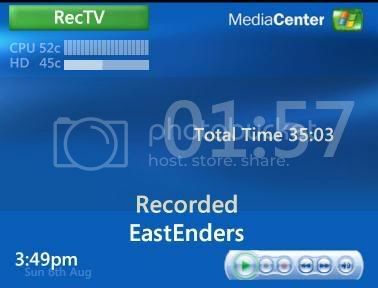 This is a screenshot if it displaying when a recoded tv show is running. Notice the temperature meters on the left hand side. 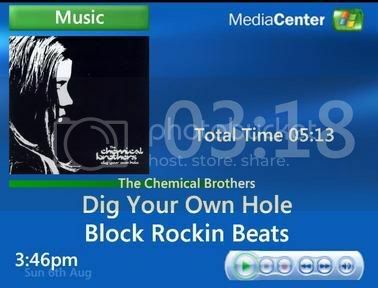 And here it is playing some block rockin beats. The temperature meters get replaced with album art. I have to say thankyou to Uziq accross at the Samurize forums. He adapted a plugin for me so that I could speed the meters up beyond their origional design. This now works very well, so when I press a button on my remote control I get almost instantaneous feedback from the status screen. I left my camera at work, so I cant show you it on the screen, but it looks dam good. To make the config I had to do some searching to get images that give that Windows MCE theme. However now with all of the meters running on Samurize, my proc useage has leapt. Playing music back i am getting 100% useage all the time. I have to make some decisions. a) Do I scrap the status screen and continue the project to my origional spec? Reluctant to do this, the screen looks so sweet, I would be loathed to loose it. b) Do I bung a fan on the processor and speed it back up to its stock mhz? I was set on the system being fanless... This is a last resort! c) Do I continue my search for status software that is lighter on the resources (I have a trial for dashboard, an aussie product that is designed specifically for MCE), then strip out what I can from the operating system? The operating sytem will be stripped down anyway just to be more power efficient and to keep the temps down. I experimented with this before, I know I can lop off at least 20% of the processor useage this way. d) Do I upgrade the processor? I have a 3000XP in my bedroom machine that never gets used to its full potential. The answer I suspect will be a mixture of c and d. I have to unlock the 3000XP processor if I am to undervolt/underclock it. I cant remember how to do this, memory sort of suggests that it can be done with a wire mod (though I prefer to use conductive ink for this kind of circuit bypassing. But the eye candy that the screen offers I think will make the project. 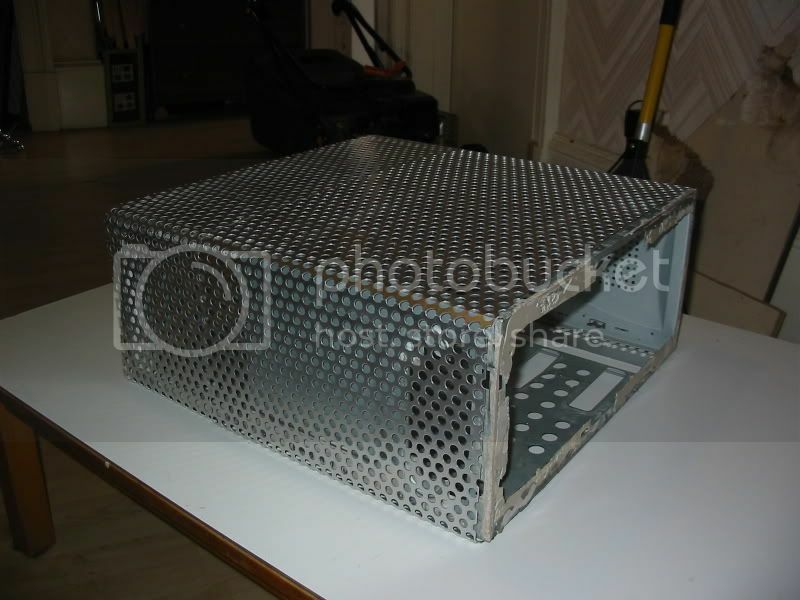 The design for the case I am going for is discrete hopefully, the screen should give it that air of quality. Any other suggestions to how to beat this one will be welcomed! How about speeding it up just enough to have some minimal reserve of computing power? What are your current temps? BTW, what's wrong with 100% CPU load if playback quality is not affected? 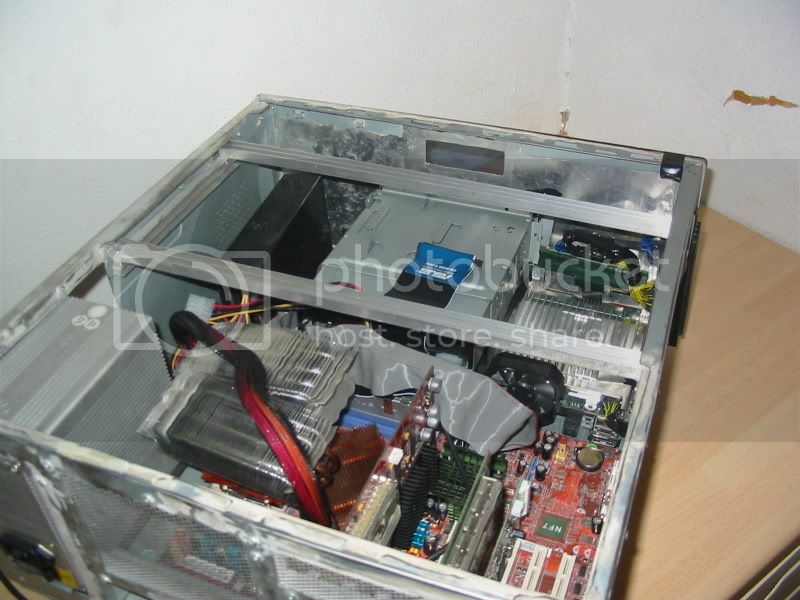 Remember this is a fanless PC. I expect it gets pretty toasty at 100% CPU load all the time. Its getting to around 55c under full load sat on a chair beside me. When it goes under the telly I can expect to see another 9c on top of that due to the restricitve space its in. Thats above my comfort zone really. And although Its playing music fine, once I have an ariel plugged in and I'm recording 100% will no doubt affect my TV quality. Or the psone screen will suffer, depending on which processes get priority. I know from experiance playing with this processor that I have reached its limits pretty much. I'll see when I've optimised the op system how much headroom Ive got. But playback and recording takes up about 66% of the current processing power. I dont think I can chop out enough to get it under. You definitely have to do something about your thermophobia . I know that the processor can take a bit more, but I am also terrified of thermal runaway. Though the mobo will shut down before the thing fries I suppose... But I dont want to test it, much in the same way that I dont test the airbags of cars by aiming at trees. Thermaphobia is a good one Considering how many on forums here and elsewhere get ruffled over CPU temps hitting the 40's. My phobia cuts in at 70c for this processor. Thanks for the kind comments.. I must take a picture of the sheet steel effort I made. Its sitting in the corner of my living room. Every time I see it now I apreciate the alu one better. Even if it won't, the Typhoon is too big to let the proc hit really dangerous temps (above 110C). When a CPU overheats, it hangs (~85C for the 2100+ Palomino at stock voltage) and while it's hanging, it cannot compute anything i.e. produce heat. The heat output returns to idling values which are not anything a decent heatsink can't handle, even if there's no fan on it. So relax, there's no such thing as a thermal runaway. Tested by myself, multiple times. P.S. My 2100+ _idles_ at 65C . It has been almost two years since i built my fanless rig, everything is still working fine. lol. I feel like a big girls blouse now (Its a scottish term). I'm still reluctant to push it that far... At least till I get the case finished. Still see some costs ahead before this project gets it complete sticker... Dont want any more! The last two nights I have been researching IC chips for the next part of the project. 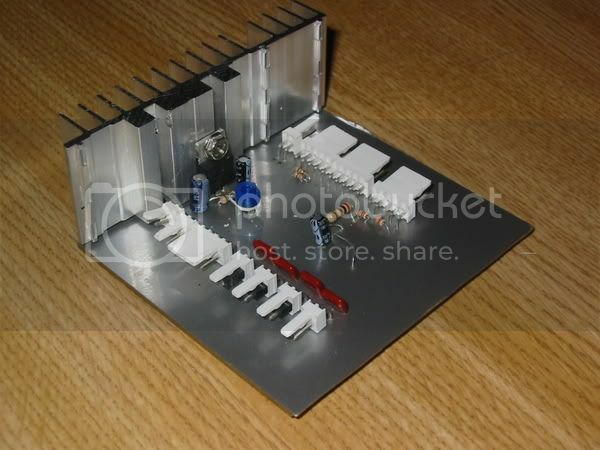 I have been thinking about producing an off board thermometer attached to the IC bus. I was buying a few bits and pieces anyway for this project, so I thought I would stretch my skills a little and make a pcb. This would let me monitor the PS2 for temps... I'm planning to go passive on it as well. Need a power regulator for the psone screen, A Lm350 voltage regulator plus caps etc will give me the 7.5v that it needs. Means I wont have a seperate plug for the screen. A 24lc21 eeprom to trick out the graphics card into thinking the psone screen is a monitor. Then I can remove powerstrip as part of my OS strip down. 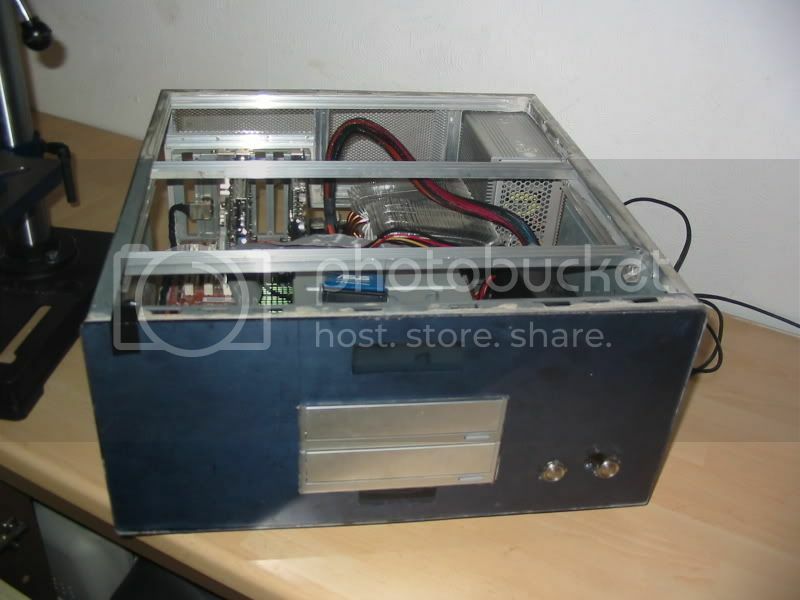 A hamond box to try alleycats homebrew HD enclosure. 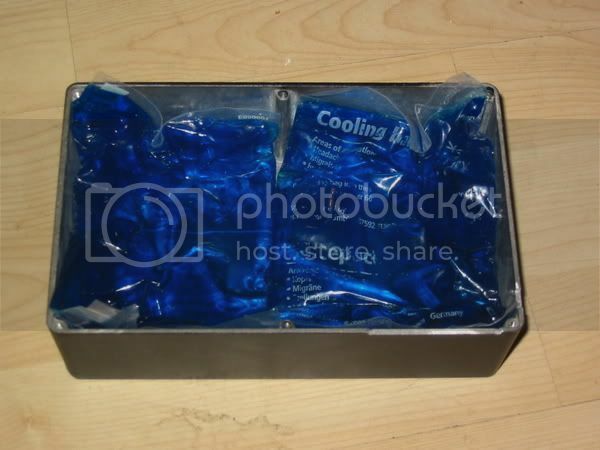 (I got some cool gel packs a while ago). I'm actually thinking about 2 of these because my 160gb NAS is full. 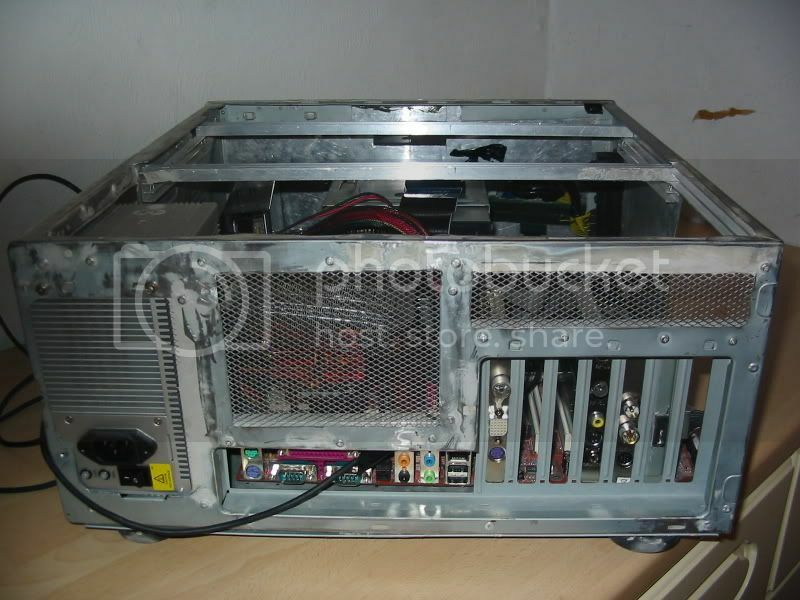 And if the HTPC is going to be powered (S3) then it may as well become a server. I think the silentdrive enclosure isn't the best idea for my HD temps. May add some fins to them to help passive cooling. A bundle of LEDS for the money shot at the end! Its vain but I think it will look good. I am planning on adding a riser to one of the graphics cards so that all the cabling for the PSone screen is held internally. I am also planning on having a pair of usb ports that will auto switch between the PS2 and the PC section. So that the two ports destined for the side of the machine will become dual purpose. Havn't found the switch that will do it, but I know its out there. On top of that lot, I intend adding a manual switch for the front of the case that will switch between (leds/screen)-(all off)-(screen only) cased on an on-on-on selector switch. Planning on having that lot on a single pcb. which will be the sort of control centre that will link the whole project together.. Never attempted anything but the simplest of circuits before, so this is part is akin to uzbekistan joining the space race! By using headers to all the components it should be a sort of linking module for the whole project. Going to attempt to use the toner transfer method for manufacturing the PCB. I dont want this project to end I guess, so I keep stretching the design brief. Tonight however I made my HD silencer. Thanks to Alleycat for sharing this gem... You guys have got to make yourself one of these things... its awesome. So here goes... The recipe for HD silence. 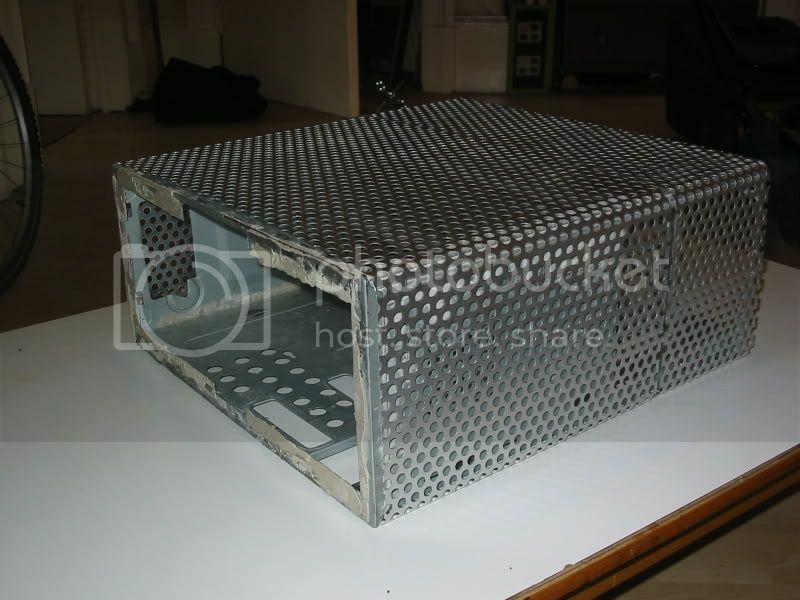 1 188x119x55mm Alu alloy Hammond enclosure. Take the hammond box. The one I got was flanged. Go for the flanged version if only because there is something inexplicably very amusing about the word flange. 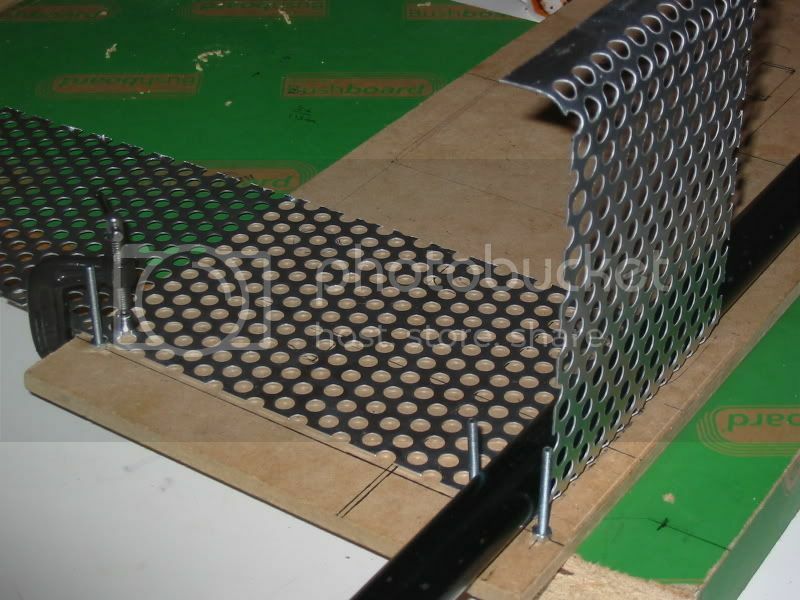 The flanges also give a conveniant way to attach the elastic...More of that in a bit. 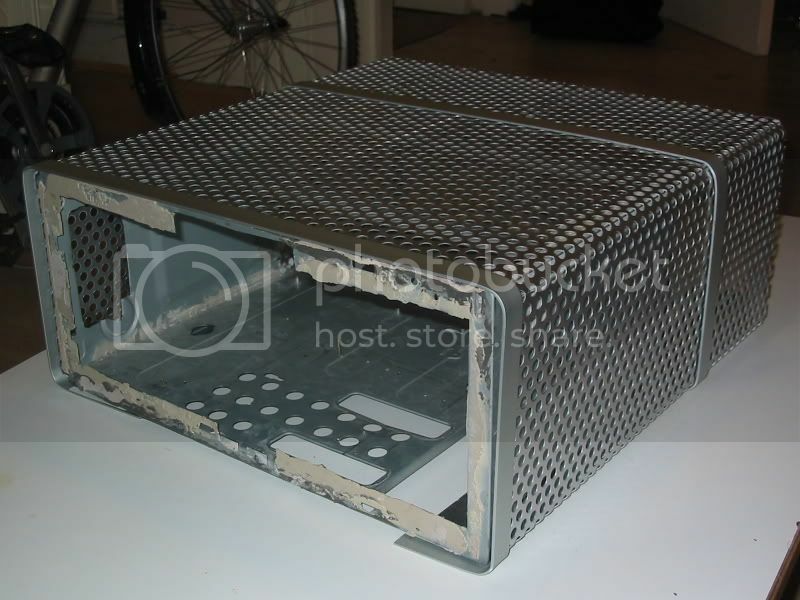 Then take 2 of the medical cooling packs and line the base of the Hammond of enclosure, folding them up the sides and back. Next take your HD and place it in the bed of cool gel that you have made. Push it around a bit to get it settled. Then mark around the top edge of the box where your cables will come out. File away the edge so that the cables fit and very snugly. 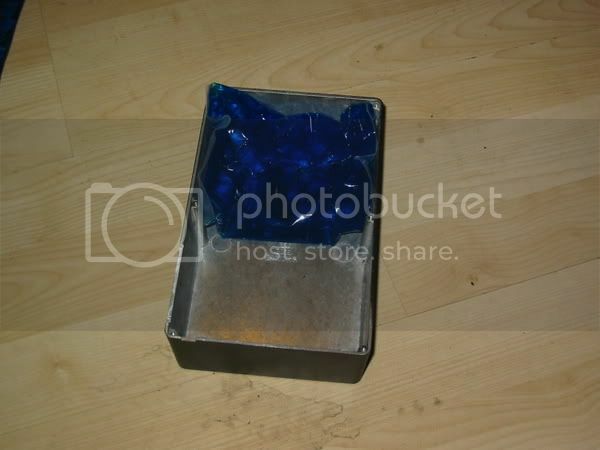 Putting a gel pack in the box while you file greatly reduces the He Haw He Haw noise by the way. When you have a good fit, wash and dry everything. Next feed several lengths of elastic to the.... Flanges. 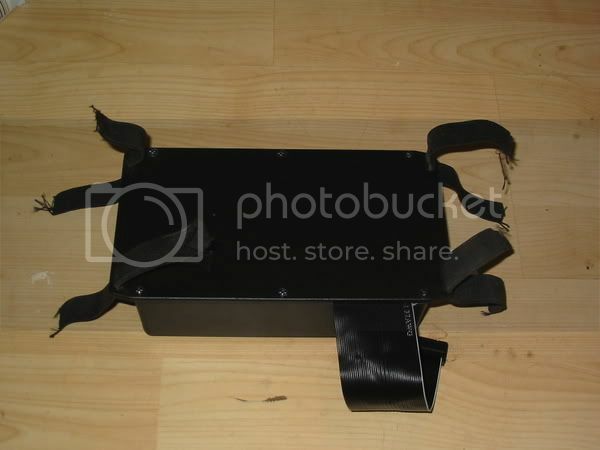 And use the elastic to tie the.... Flanged Hammond enclosure to the mounting brackets/points/whatever inside your case. I have knotted these in this picture, when I get to final build, I will sow the elastic into neat loops. Then power your machine on, hoping that those bags have not burst. And start punishing your HD in a vain attempt to get it to make some noise. Mine is now silent unitil i get my ear to within 20cm of the drive. Thats in a system with no other moving parts. I am so happy I could burst! 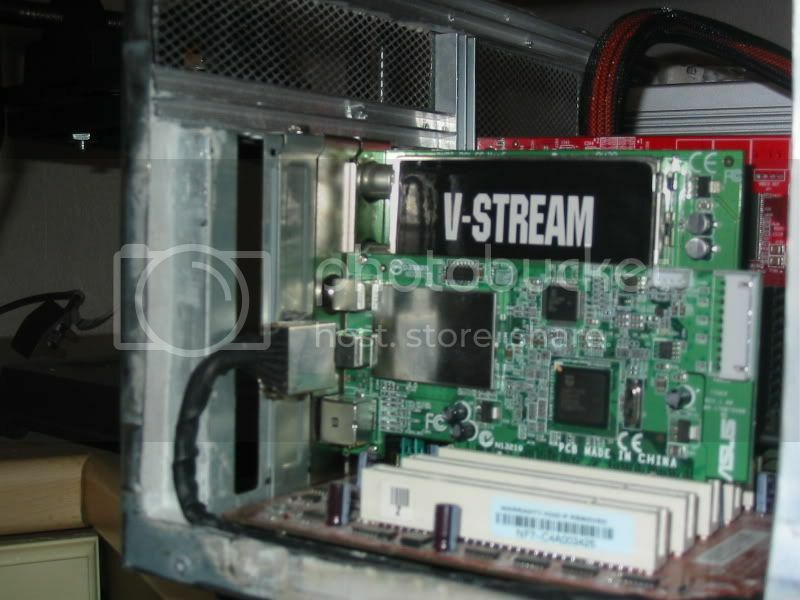 It replaces a silentdrive enclosure, Which unsuspended was getting to 44c when recording and watching TV. I have still to test this new enclosure. Initial figures look good, but I figure that the gel will make the temperature change more gradual than before. I'll update with temps in a bit. Been spending the few days learning how to build pcbs. Have been using ExpressPCB. At first the whole pcb design thing seemed difficult, but now I seem to have got the knack of it. One it holds the maxim 1668 controller. Thats on the top right, of the board in the piccie... It will be top left when I have printed it on acetate and turned it over... To the right of it the thermometers will plug in. They will be made from transistors. Next underneath is just a pass through for the psone screens signalling. Thats the lines running left to right (or is it right to left?) accross the board. Under that and to the left is a 24LC21 eprom chip. This is going to be programmed with the correct settings to force the matrox GPU to speak to the psone screen. Will mean I wont have powerstrip running anymore. My mental fragility was exposed as I desperately tried to work out what pins to connect, the pcb will be reversed on one plane when it finally prints. Ended up printing someone elses maxim based circuit onto acetate. This gave me a chance to try out the toner transfer method. I used a laser copying onto injet acetate. I tried a sheet full of circuits one at a time to try out various techniques. I got the best results heating it up real hot, then running it under cold water. The accuracy was good, but I wanted to try photoresist as well. 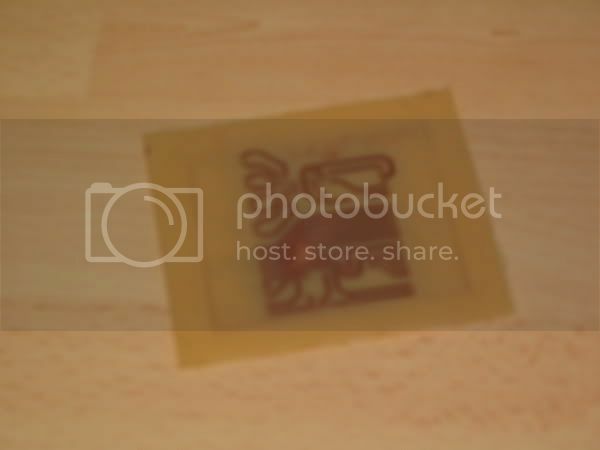 I tried the photoresist technique for making PCBs. 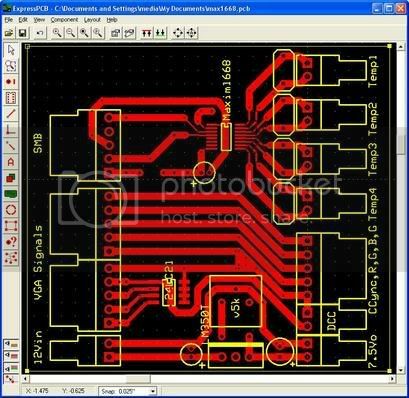 I can recomend this technique for noobs to PCB manufacture.. Its so much easier to get a good print on the board than the toner method. Here is the setup I used. I have an OHP which uses a 650w halogen lamp. This was going to be my method of exposure. First of all I inkjeted two copies of the circuit. I also added a test bar to the top of it. This had two functions. One to let me try a test strip, to determine my exposure time. 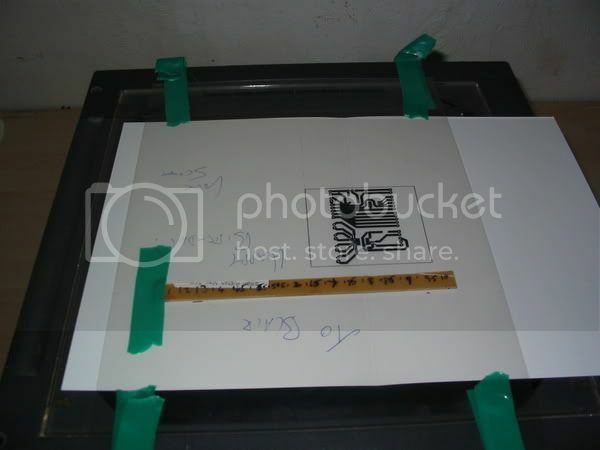 Secondly it was to ensure that the two sheets of acetate were lined up correctly. I should mention that I removed the Fresnell lens before begining. The Fresnell would leave dark rings on the image. I have looked round the intermwebby, but noone else seems to use OHP's for this... I may have hit onto something here, it seemed obvious to me. 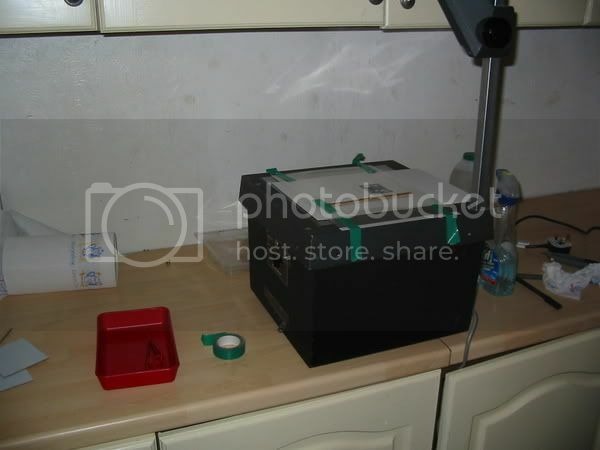 This photo is me getting ready to make a test exposure. The card under was supposed to be for cutting out the light. I intended to move it every 30 seconds to expose more of the board. When I turned the OHP on however light shone throught the card. I used some very thin alu sheet instead. The rest is pretty boring, I just followed the instructions on the beginners kit I got from Maplins... Exposure, develop, etch and clean. The camers still is rubbish for the closeups. There is a little pitting on 4 of the 0.5' tracks. This was cause i smudged the negative. in this photo you can see the less shiny area where the pitting is worst. There is a hole in fact, but by good fortune it occured on the ground plane where I had widened the track. Tested everything first by holding it against the lamp, then by multimeter. All is well. I didn't expect to get it right the first time so hey ho. I'm in a quandry. 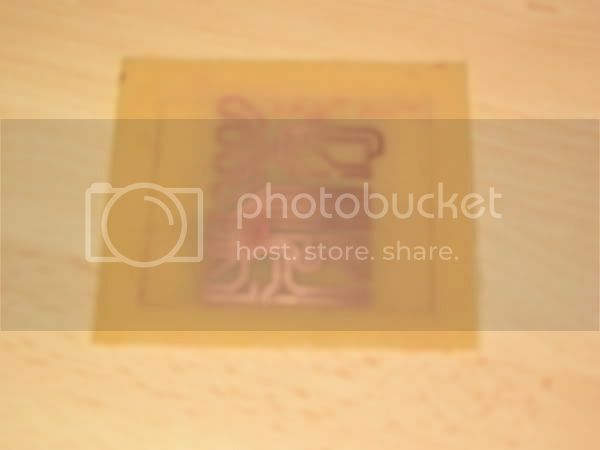 Do I reprint my negs, and make a third attempt, or be happy I have a working PCB and move on. I'm thinking the latter, the imperfections are really not that noticable. I think I will drill it and use it. At least then if I mess up the drilling, I still have a spare photo board to make another. I finished the pcb. Mostly without trouble, but I had an issue with the power regulator. First of all the good stuff. The temperature sensor worked straight away. 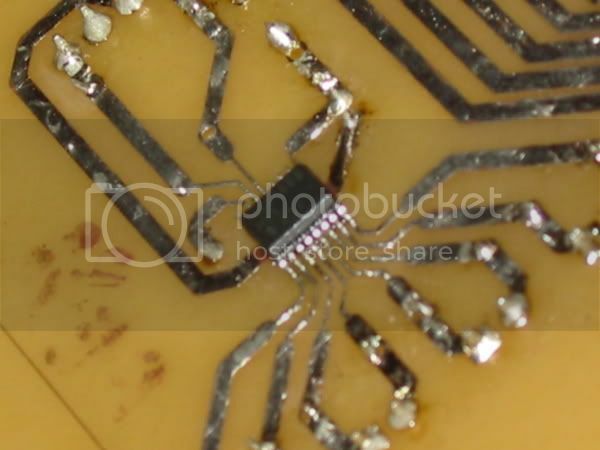 Even though soldering the 5mm 16 pin soic looked terrifying, it was as easy, if not easier than the through board solders. Here is the Maxim 1668 in all its glory! This is my favourite part, it looks so difficult to do, but it really isn't. From now on I'm doing surface mount stuff in all of my projects. Tested it first, and the local sensor worked first time. I checked it with a medical thermometer, and the accuracy is better than the +/- 1c that maxim quote. Here is the reverse side of the PCB. The 24LC21 chip is there as well. It worked first time as well. Though I haven't got it programmed yet to the right settings, it is accepting programming and is reading correctly by the matrox card. 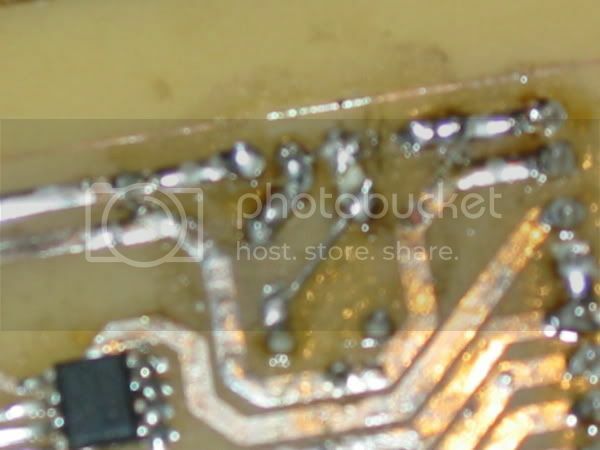 You can see also that I tinned the copper traces with solder. Cleaned them fluxed them and then drew on a thin layer of solder. In real life you can't see the imperfections. Now the gory bit. I tried the power regulator, but all was not well. It could be adjusted to the right voltage using an adj resistor. Then when I plugged the psone screen in, it just didn't light up... Bugger. After posting for help on SPCR someone pointed out what was wrong. I had followed the manufacturers diagrams for the regulator. However the diagrams had the wrong pin assignation on them! How stupid is that? Then I had an issue. Do I start again? Do I keep the mostly working pcb and build a power regulator seperately? Nope. I had another plan. I tore up a couple of tracks, inserted a couple of jump wires and lo and behold I had a working regulator. On the printed side (above) of the pcb it is a little messy, but on the side that will be visible, you can hardly tell the difference. The other thing I am happy with is that I finally worked out how to use the camera... No more blurry closeups! Now I have to come up with a creative way to mount it. That heatsink is live... Its only 7.5v so its not dangerous, but it will have to remain isolated from the chasis of the puter, I get sparks otherwise! This means all of the psone screens wiring is now held inside the case. I attached enough wire that I can hide it when it comes to final build time.